Holdings: Ab1 Factory, CyberCola, SWTel, SyntroAlpha, Syncraft?, SW City Times? Shane Syntax, now the Mayor of SW City, began the opportunistic Syntax Corporation in 1993 as a small air filter production company, headquartered in a cramped office block in Cirrus Street. Over the years, Syntax developed influential and ground-breaking business tactics based on trust and sheer daring that had not before been seen in SW City's normally ruthless corporate environment. Within a few short years, SynCorp not only had established itself as a major player in the city's company-dominated political scene, but had secured its CEO a place on the Core Council. This move was bitterly despised by SynCorp's major competitor, CommieCorp, as the upstart young company had done in seven years what it took the Comit family over eighty years and four generations to do. 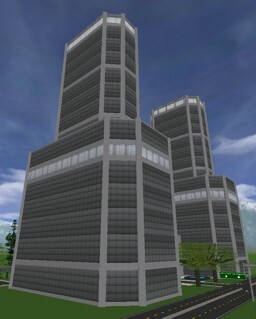 As a result, when CommieCorp President resigned from the dual position of Republic President and Mayor of SW City, it did not take long for the populace to decide that Shane Syntax should take his place. "The sky is the limit for SynCorp"
Syncorp's large team of highly regarded scientists and engineers are always at work trying to find the next big market in which to expand to. The emergence of the fuel cell has been one market that Syncorp has been looking at getting into ever since CommieCorp struck rich with their Gas-in-a-Can operation. Digital & high-definition television, satellite communications and space travel are also other fields that the CEO has expressed interest in. Because of its opportunistic nature and a reputation for pushing boundaries, SynCorp has been branching out exponentially for the last few years, acquiring a fuel station chain, the city's only Ab1 factory, and just recently a line of hovercrafts. The CEO has also showed interest in developing alternatives to producing energy; the main focus being wind power. Should this trend continue, the Syntax Corporation is sure to dominate over its competition in coming years.